Red Oak - Shipped directly to you. DESCRIPTION Red Oak heartwood is similar to other oaks and coloration runs from a light tan to pink with a reddish tinge. The wood is predominantly straight grained and coarse textured. Red Oak has a somewhat less attractive figure than White Oak due to smaller rays. Weight is about 48lbs per cu. ft. MECHANICAL PROPERTIES High crush strength, medium bending strength and stiffness and considered a very good steam bending wood. WORKING PROPERTIES Moderate blunting effect on cutters. Density varies. Gluing properties vary and nailing may require pre-drilling. Takes stain well and polishes to a good finish. DURABILITY Heartwood is non-durable and susceptible to insect attack. Moderately resistant to preservative treatment. Sapwood is permeable. SEASONING Tendency to dry slowly with checking, splitting and honeycombing. Needs care in both air and kiln drying. Medium movement. USES Furniture, veneer, interior joinery, flooring, plywood. Not suitable for exterior work. COMMENTS Grain may need to be filled to achieve smooth finish. Above: Red Oak Sidebaord. 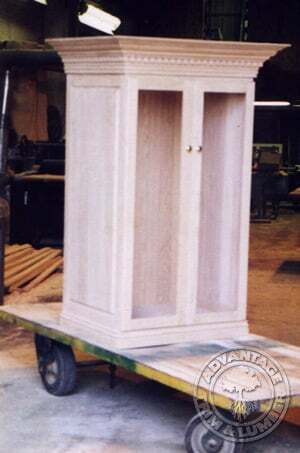 The top of this sideboard was made with a edge-glued panel from AdvantageLumber.com®. 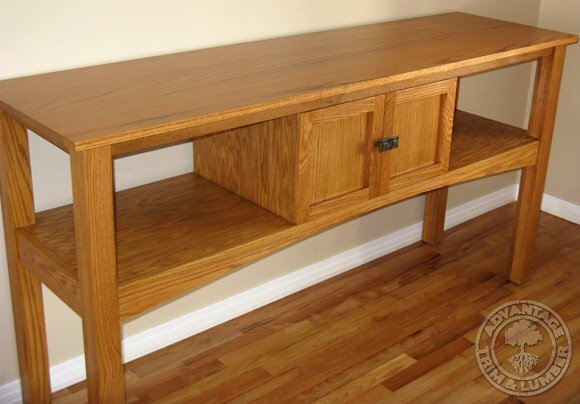 Above: Red Oak stereo cabinet built by Rob Pelc. Note the consistency in nice red color in our Northern Red Oak.